Bright skies mixed with the occasional rain shower mean spring, of course. The ume blossoms are running late this year, and their bright colors and soft scent are inspiration enough to head on out to one of the great markets listed below. 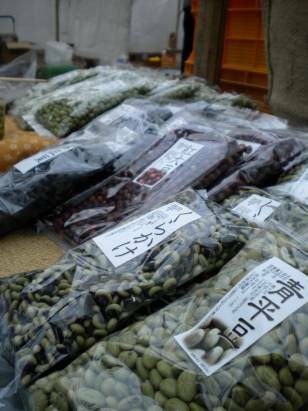 I'd also like to point out the addition of a new one - the Nippori Farmer's Market - that promises to be a dandy. I'll be there on Sunday to investigate, enjoy the taiko performance, and hopefully venture home with a new recipe or two to try! A terrific two days of seasonal vegetables, fruits, homemade treats, and even some fun activities for those whipper-snappers! Held every Sunday in Nippori this market is a new one to me, but it promises to be good. I'm planning a visit followed by a full update, but don't be shy to head on out to see for yourself. Growers from the Tokyo-area as well as a number from Fukushima Prefecture will be showing off their spring fare, and this weekend folks can bring along items they wish to test for cesium. Directions: East Exit of Nippori Station and look for the veg! A unique event in the heart of the city that a vegetable loving geek like me wouldn't miss for the world. What better way to get the healthy vitamins and minerals you need to sustain an evening of karaoke and izakaya hopping? A recent first visit to this market was well worth the trip for the number of organic growers and getting to meet a Tokyo farmer from just down the tracks in Kokobunji. Another nice market not far from the sumo stadium in Ryogoku it's worth casing out for the neighborhood as well as the vendors. Another great market somewhere in size between Kichijoji and the United Nation's University Farmer's Market, it often features from a particular growing region as well as heaps of farmers and producers from nearby Chiba and Saitama, too. Directions: Turn left out of the station and cross the courtyard toward Tokyo Kouku Keitan. Look for the fun under the overhang!